Processed sugar and HFCS (High-Fructose Corn Syrup) are not the only sweeteners to be avoided. There are sweeteners such as Aspartame, which are linked to potentially harmful health effects. Aspartame itself has no calories, so it couldn’t possibly contribute to increased body weight, right? Well, this is where things get really interesting. Some studies suggest that Aspartame may increase hunger. Increased appetite may then result in greater caloric intake and increased risk of obesity. Other studies show the opposite effects making the effect of aspartame on appetite inconclusive. Short-term studies have shown that Aspartame has some negative health effects such as migraines. Also, it is unclear what the long-term health effects are. Aspartame may hide behind brand names such as NutraSweet, Equal, Spoonful, and Equal-Measure, but it still accounts for 75 percent of adverse reactions to food additives reported to the FDA according to Ann Louise Gittleman, Ph.D. in Get the Sugar Out. Based on an article from 2008 published by Sharon Fowler in the journal Obesity (Fueling the obesity epidemic? Artificially sweetened beverage use and long-term weight gain), individuals who consume diet soft drinks are at an increased risk of overweight and obesity compared to those who don&apos;t.
The risk of obesity continued to increase dramatically with increased consumption of &apos;diet&apos; soft drinks and was independent of other factors like exercise, smoking or socioeconomic status. This epidemiological study doesn’t prove that diet soft drinks cause obesity. To be more precise, people who drink more diet soft drinks may also have other behaviours that put them at increased risk of gaining weight. In a nutshell, Aspartame may cause bloating, sugar cravings, weight gain, and an increased appearance of cellulite. Some say it may be linked to cancer but there is no evidence of such claim. Aspartame is commonly found in sweeteners (syrups, sugar substitutes, etc. ), sugar-free products, cooking sauces, cereals, diet sodas (Diet coke, etc. ), sugar-free yogurts, flavored water, drink powders (beware of some protein powders that contain Aspartame) and even children&apos;s medicines and toothpastes. It is your personal conviction that artificial anything is of no use to humans. It's also the personal conviction of the people doing the research on artificial sweeteners. Saccharin especially, has been around since the 1870's and there have been incalculable tests done by the sugar industry since then to discredit it's use like they did with cyclamates. Gary Taubes has found no scientific research that points to anything like these researchers "want to be true." I'll take his word for it. "The Case Against Sugar"
You say that "It is your personal conviction that artificial anything is of no use to humans." I made no such assertion. Not all artificial sweeteners are equal but all have shown to have side effects. 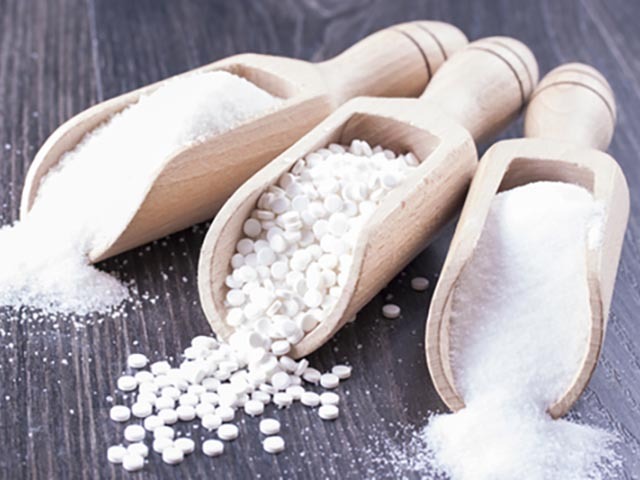 Some artificial sweeteners may have been around for decades but they have never been used in such large quantities like they are these days. I used to have headaches every time I had diet soda. Since there are tens of healthy low-carb options with no side effects or potential long-term issues, I choose to avoid artificial sweeteners. Aspartame is not harmless. I know that from personal experience. I never drink fizzy sodas but was given one to drink. Had no choice but to accept. A famous brand name in South Africa. Nope. Snake venom is made from amino acids (proteins). Doesn't mean they are good! Aspartame is harmless. Aspartame is composed of two amino acids, two of the twenty basic amino acids, aspartic acid and phenylalanine, which are programmed by DNA. Amino acids compose all proteins. We are basically composed of proteins. If you haven't eaten or drank for a while and you taste something sweet in your mouth you are tasting your own aspartame that happened to form from loose amino acids from your proteins in your mouth. It is obvious that aspartame is absolutely harmless. Having seen the available research, I agree to disagree. Why is ketocal enteral formula full of aspertame? Just remind that Aspartame is allowed in many countries, even the EU which has a quite restrictive equivalent to FDA. So, I can only consider this article as an opinion and FUD on artificial sweeteners. Yes, I mentioned other artificial sweeteners too (in the intro) but only analysed the effects of Aspartame. Yes, it is allowed (see the comparison of study fundings). Being allowed doesn't imply safe in the long term. "Some studies suggest that Aspartame may increase hunger, resulting in greater caloric intake and increased risk of obesity"
It **may** result in greater caloric intake and increased risk of obesity. It's not about self-discipline at all, it's about controlling hunger / cravings by reducing carbs (more about this is in books by Dr Volek & Dr Phinney). You can use aspartame keto (it doesn't kick you out of ketosis) but it won't be the healthiest option. So right, artificial sweeteners only made my body sick and crave carbs. I used to drink diet soda and use splenda for my low-carb treats. Both aspartame and sucralose are poison! I gave up diet soda years ago... I sleep so much better and have no sugar cravings since then!